This tutorial shows how to create a virtual Linux workstation running CentOS with an attached display-capable GPU. (To create a Windows Workstation, see the tutorial for Creating a virtual GPU accelerated Windows workstation.) Google Cloud Platform (GCP) offers two display-capable GPUs: NVIDIA Tesla P4 and NVIDIA Tesla P100. After you create the virtual workstation, you learn how to remotely access it using Teradici PC-over-IP (PCoIP), a remote desktop protocol widely used in the media and entertainment industry. PCoIP offers features essential to media production workloads, such as color accuracy and support for lossless display. Note: This tutorial does not include advanced security features such as fine-grained SSH key management, certificate issuance, or two-factor authentication (2FA). A full deployment would involve a connection broker, which helps enable a stronger security profile for connecting to virtual workstations. A virtual workstation (VWS) is a cloud-based workstation that can be accessed from anywhere using an internet connection. The concept of remote computing dates back to the 1960s with so-called dumb terminals, but a virtual workstation built using modern cloud infrastructure is a powerful, economical alternative to an expensive workstation at your desk. With virtual workstations, there is no capital expense. You can customize the size and power of the VWS to the exact specifications required for a particular task. You pay only for the resources used, when they're used, and you're billed by the second. You don't pay for electricity to power the workstation or for the HVAC to keep it cool. You also don't have to pay a staff of IT professionals to build physical workstations, upgrade motherboards, add RAM, or replace outdated GPUs; all of this is managed on GCP. Create a Compute Engine instance with a GPU. This instance serves as the foundation for a virtual workstation. Install NVIDIA drivers on the virtual workstation. Install Teradici PCoIP Cloud Access Software on the virtual workstation. Connect to the virtual workstation from your Mac or Windows computer using a PCoIP software client or Zero Client, a type of hardware endpoint. To access the virtual workstation from a Linux computer, contact your Teradici representative. You can use the pricing calculator to generate a cost estimate based on your projected usage. As of the time of writing, the approximate cost for a typical media workstation configuration illustrated in this tutorial is US$2.30 per hour. 24 vCPU, 32 GB RAM custom machine type. 100 GB SSD persistent boot disk. NVIDIA Tesla P4 Virtual Workstation GPU. Internet egress represents data that streams from your virtual workstation to your local display client and is billed at internet egress rates. Variables that affect data egress during a PCoIP session are bandwidth, screen resolution, number of display monitors, applications used, and the type of activity on each monitor. The cost in the example is based on an average usage of 10 Mbps. Teradici's Workflow Planning Guide can help you understand different workload requirements. Note: Costs differ depending on region and connection method. These estimated costs are based on connection over the public internet, with resources located in the us-central1 region (Iowa). This tutorial uses gcloud and gsutil commands, which you can run from a Cloud Shell instance launched from the GCP Console. If you want to use gcloud and gsutil on your local workstation, install the Cloud SDK. The tutorial shows you how to run commands in Cloud Shell; if you use the Cloud SDK on your workstation, adjust the instructions accordingly. A GCP project with quota for Virtual Workstation GPUs in your selected zone. You can get a listing of GPU availability using the gcloud compute accelerator-types list command. A Teradici Zero Client or the latest Teradici software client for Windows or Mac to access the virtual workstation. For access to a Linux software client, contact your Teradici representative. A CAS license of Teradici PCoIP. You can sign up for a trial license, or contact your Teradici representative. You will be provided with a 60-day trial registration code to use for this virtual workstation. The following diagram shows the components that are used in this tutorial to deploy a single virtual workstation. Optional components shown in the diagram include different ways to connect to your virtual workstation, object and shared storage, and an additional instance for serving third-party licenses. An important factor when you deploy a virtual workstation is the latency between your location and the instance you create. The lower the latency, the better the experience. Therefore, you want to work in a zone that's geographically closest to you. To learn more about regions and zones, see our Cloud Locations documentation. Take note of the zone that's physically closest to you. You can attach P4 GPUs to any machine type, but each GPU that's added to a virtual workstation must be coupled with a minimum number of vCPUs. This prevents oversubscription of any one resource. For the NVIDIA Tesla P4, you can attach up to 24 vCPUs to one GPU. To add more than 24 vCPUs to your virtual workstation, you must add an additional P4 GPU for every additional 24 vCPUs. For example, a 48 vCPU virtual workstation would require you to attach two P4 GPUs. The example in this tutorial consists of a 24 vCPU virtual workstation, which is the maximum number of vCPUs allowed per NVIDIA Tesla P4 GPU. The Teradici Graphics Agent (which you install on your virtual workstation later in this tutorial) requires you to enable IP forwarding and to allow HTTPS server traffic during virtual workstation creation. Note: There are some restrictions to keep in mind when creating a virtual workstation with attached GPUs. Restrictions that apply to this tutorial have been addressed, but it's a good idea to familiarize yourself with these restrictions before you create your virtual workstation. In Cloud Shell, create the Compute Engine virtual workstation instance. You must provide values for the placeholders in brackets, such as [NAME]. Your virtual workstation is created in your project's default VPC network. If you want to create your virtual workstation in a different VPC network, you can specify a different network by adding --network=[NETWORK] to the command. Note the virtual workstation's external IP address. You will use it later in the tutorial. After you create the virtual workstation, you sign in to the machine so that you can configure it. Set your account password. Teradici PCoIP requires a user password to be set. When you're prompted, enter a password. You will use this password later in the tutorial to log on to your virtual workstation with the Teradici PCoIP Client. The default Google Cloud CentOS 7 image is a minimal installation of CentOS 7.x. The next step is to install libraries that are necessary to run your virtual workstation as a graphics workstation. 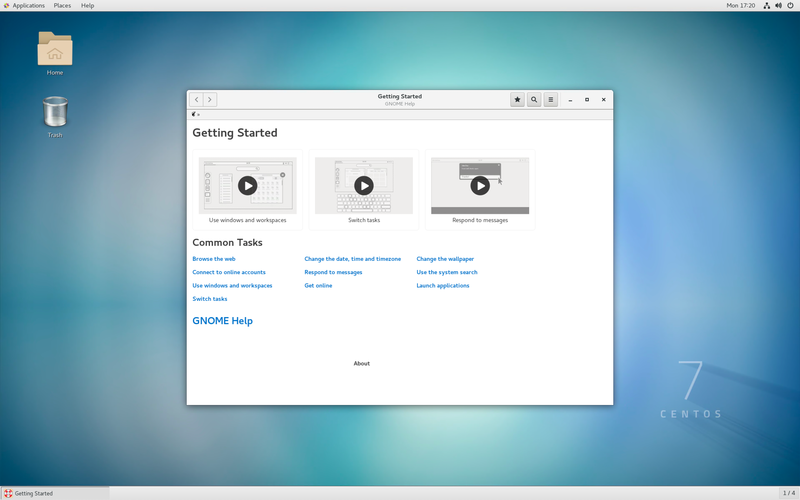 For this tutorial, you also install the KDE window manager. sudo yum -y groupinstall "KDE desktop" "X Window System" "Fonts"
sudo yum -y groupinstall "Server with GUI"
Your connection from Cloud Shell will be closed. NVIDIA Tesla P4 and P100 GPUs work on GCP only with qualified NVIDIA Quadro Virtual Data Center Workstation (vDWS) drivers for both compute and display workloads. These drivers can be downloaded from a public storage bucket. For this tutorial, you use the latest graphics drivers that are available at the time of writing: GRID6.2 Linux driver (version 390.75). The latest qualified driver can always be found under the GRID directory with the highest version number; if you find a newer driver, use that one. Download and install the driver. If you're using a version of the driver that's more recent than 390.75, change the command accordingly. If you're prompted to install 32-bit binaries, choose Yes. If you're prompted to modify the x.org file, choose No. If you don't see output that's similar to this listing, refer to the Troubleshooting section later in this tutorial. Teradici Cloud Access Software (CAS) provides a Graphics Agent that runs on your virtual workstation, delivering the desktop to your hardware or software client. To use the Teradici agent, you must have a license, as noted earlier in the tutorial. The PCoIP client communicates with your virtual workstation using several ports. You must set firewall rules that allow traffic to and from your virtual workstation. On your local computer, download, install, and launch the PCoIP Client application for Windows or Mac. For access to a Linux PCoIP client, contact your Teradici representative. In the Host Address field, enter the external IP address of your virtual workstation. If you want, you can enter a name for the connection. Note: By default, PCoIP traffic is encrypted using AES-256. However, PCoIP CAS uses a self-signed certificate that's issued by Teradici. This might trigger the following warning when you connect. You can remove this warning by creating and installing your own certificates. For the purposes of this tutorial, you can ignore this warning by clicking Connect Insecurely in the dialog. For more information on creating and deploying your own certificates, see Custom Security Certificates on the Teradici site. Run GPU benchmark tools, such as glxgears or glmark2, which are simple programs to test graphics performance on a Linux workstation. Install Blender, an open source 3D software package. Run render benchmarking tools for popular renderers such as V-Ray, Octane, or Maxon. Use Google Chrome to browse your favorite sites or play YouTube videos. This section lists issues you might encounter when you set up or connect to the workstation. Issue: NVIDIA-SMI has failed because it couldn't communicate with the NVIDIA driver. Solution: Reinstall the driver and try running nvidia-smi again. If the command still fails, try uninstalling the NVIDIA driver, installing the dkms module, and then reinstalling the driver. Doing this registers the dkms module into the kernel so that updates of the kernel won't require a reinstallation of the graphics driver. Issue: X11 doesn't start as intended. As the superuser, edit the file /etc/default/grub. A blank string means that the Nouveau driver is not installed. For more information on the Nouveau driver, see Common Problems in the NVIDIA documentation. Issue: You are using a PCoIP Zero Client, and you are unable to connect to your virtual workstation. Solution: Ensure that your Zero Client has firmware version 6.1 or later installed before you connect to the virtual workstation. For more information, contact your Teradici representative. After you've finished the tutorial, clean up the resources you created on GCP so you won't be billed for them in the future. Learn how to create a virtual GPU-accelerated Windows workstation. Learn more about NVIDIA GRID GPUs for graphics workloads. Learn more about NVIDIA Quadro Virtual Data Center Workstation software. Learn more about Teradici Cloud Access Software. Learn more about how Teradici PCoIP differs from other remote desktop protocols. Try out Teradici's preconfigured virtual workstations for Windows and Linux in the Google Google Cloud Platform Marketplace.